The ability of animals to survive dramatic climates depends on their physiology, morphology and behaviour, but is often influenced by the configuration of their habitat. Along with autonomic responses, thermoregulatory behaviours, including postural adjustments, social aggregation, and use of trees for shelter, help individuals maintain homeostasis across climate variations. Japanese macaques (Macaca fuscata) are the world’s most northerly species of nonhuman primates and have adapted to extremely cold environments. Given that thermoregulatory stress can increase glucocorticoid concentrations in primates, we hypothesized that by using an available hot spring, Japanese macaques could gain protection against weather-induced cold stress during winter. 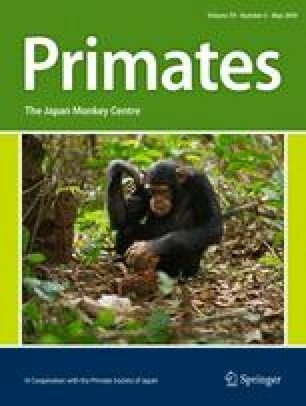 We studied 12 adult female Japanese macaques living in Jigokudani Monkey Park, Japan, during the spring birth season (April to June) and winter mating season (October to December). We collected faecal samples for determination of faecal glucocorticoid (fGC) metabolite concentrations by enzyme immunoassay, as well as behavioural data to determine time spent in the hot springs, dominance rank, aggression rates, and affiliative behaviours. We used nonparametric statistics to examine seasonal changes in hot spring bathing, and the relationship between rank and air temperature on hot spring bathing. We used general linear mixed-effect models to examine factors impacting hormone concentrations. We found that Japanese macaques use hot spring bathing for thermoregulation during the winter. In the studied troop, the single hot spring is a restricted resource favoured by dominant females. High social rank had both costs and benefits: dominant females sustained high fGC levels, which were associated with high aggression rates in winter, but benefited by priority of access to the hot spring, which was associated with low fGC concentrations and therefore might help reduce energy expenditure and subsequent body heat loss. This unique habit of hot spring bathing by Japanese macaques illustrates how behavioural flexibility can help counter cold climate stress, with likely implications for reproduction and survival. We would like to thank Mr. Haruo Takehushi, Mr. Toshio Hagiwara, Mr. Atsushi Takizawa, Mr. Yukihiro Sato, and Ms. Kayo Miyata from Jigokudani Monkey Park and Ms. Yukari Murano for their assistance during the study and for providing us support and useful information. Our gratitude to Mr. Akihisa Kaneko, Ms. Mayumi Morimoto, and all staff from Center for Human Evolution Modeling Research at the Primate Research Institute for their assistance during the biological validation of the hormonal assay. We also thank the associate editor and two anonymous reviewers for their constructive comments, which helped us to improve the manuscript. The study was funded by the Primate Research Institute; the Leading Program in Primatology and Wildlife Science (PWS); a grant-in-aid from the Japan Society for the Promotion of Science (JSPS) no. 16J00399, and a scholarship to RSCT by the Nippon Foundation.